The Japan Foundation, New Delhi organized a two-day event on February 22 and 23, 2018, titled Okinawa Ki Hawa ("Wind of Okinawa" in Hindi), inviting as a special guest Kazufumi Miyazawa, the musician behind the global hit song "Shima Uta" (Island Song) and activities to preserve the music and culture of the chain of islands that form Japan's southernmost prefecture. 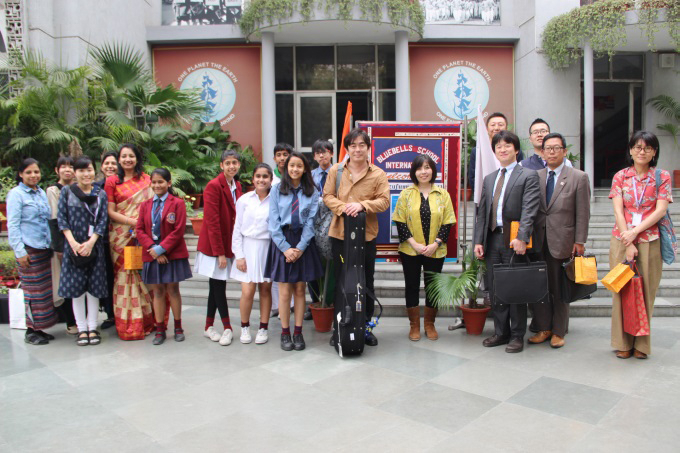 By offering Japanese-language learners in India an opportunity to experience Okinawan music and culture, the event sought to deepen their interest in Japan and enhance their motivation to learn the language. 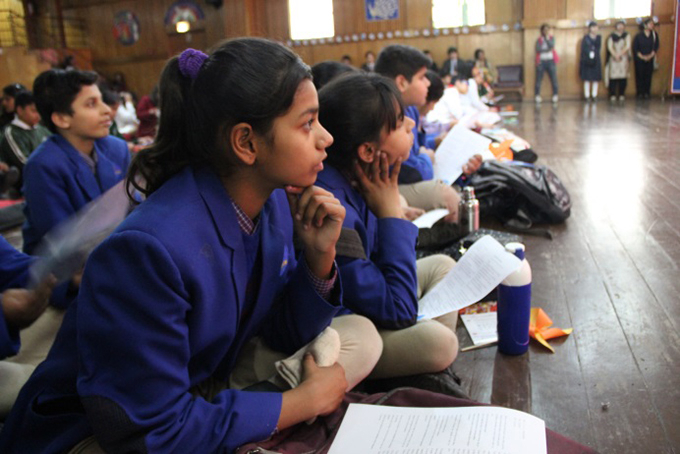 Participants on the first day were learners of various ages attending Japanese-language courses at the Japan Foundation, New Delhi, as well as at Japanese-language schools and institutes in and around New Delhi. Those on the second day were elementary and junior high school students interested in Japan. 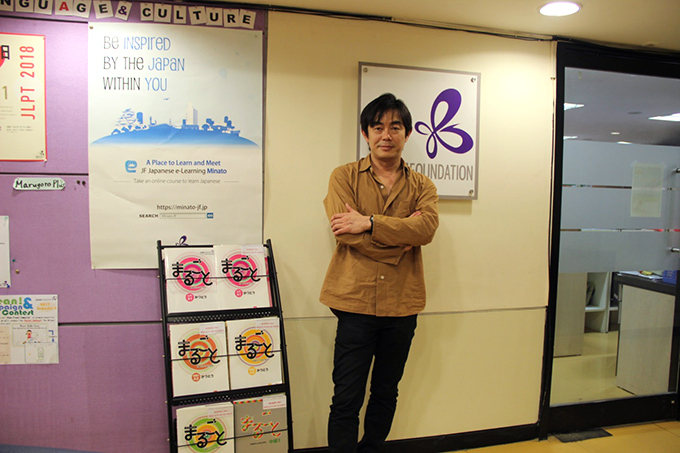 In an interview with the Japan Foundation, Mr. Miyazawa spoke about his performance at the event as well as his activities concerning Okinawan culture. Mr. Miyazawa said he never had an opportunity to visit India before. —You are known as a globe-trotting musician who has performed in various parts of the world, including the United States, Europe, Brazil and Southeast Asia. Have you ever visited India before? Miyazawa: Strangely, I never had the opportunity to visit India before. Partly because of my age, I thought I would never set foot in the country. Last autumn, however, I was invited by Ayumi Morris at the Japan Foundation, New Delhi to take part in the event. I thought I had actually received an invitation (from something mysterious), and decided to accept it. —You were on a mission to introduce Okinawan culture to people in India, weren't you? Miyazawa: Yes. Ms. Morris hails from Okinawa. In 2016, she started a stint at the Japan Foundation, New Delhi, as a teacher of Japanese. She said she had invited me because of her wish to introduce Okinawan culture to India. While the request I received was not clearly defined in detail, I felt I had a grave responsibility for the success of the event (laughs). I'm not even from Okinawa. —I think your activities make you the right person for the mission. When you decided to accept the invitation, which elements of Okinawan culture did you want to introduce to people in India and in what ways? Miyazawa: The first thing that came to my mind was Indian people's passion for cinema. When we talk about Indian films we usually talk about musicals. From this point of view, I made a list of elements common to Indian and Okinawan cultures. People in Okinawa also love songs and dances. There is a traditional Okinawan performing art called Kumiodori. Simply put, it is a type of musical theater. Theatrical and dancing elements are mixed and fused in Kumiodori performances just as in musicals. I thought it would be a good idea to first show footage of a Kumiodori performance, not a traditional version dating from the early 18th century but a modern version arranged by contemporary artists to suit contemporary tastes. Another thing that crossed my mind was Eisaa, a traditional form of Okinawan folk dance, performed during the summer months to the accompaniment of drumming by dancers. I thought Indian people would like Eisaa because they certainly love the sounds of drums. So I first showed footage of Kumiodori and Eisaa performances to the participants. As I had expected, the video drew a very enthusiastic response. Then, I talked about Okinawa and the sanshin, a three-stringed traditional Okinawan musical instrument. And lastly, I performed my own song "Shima Uta." —How old were the people in the audience? Miyazawa: The participants on the first day were people of all ages learning Japanese at the Japan Foundation. On the second day, we had elementary and junior high school students. The content of the program was almost identical on both days. After showing the footage, I sang my song at the end. I strongly wanted to let Indian people hear the sounds of the sanshin, so I actually took my sanshin and acoustic guitar from Japan. On the second day, Indian children got on stage and danced. 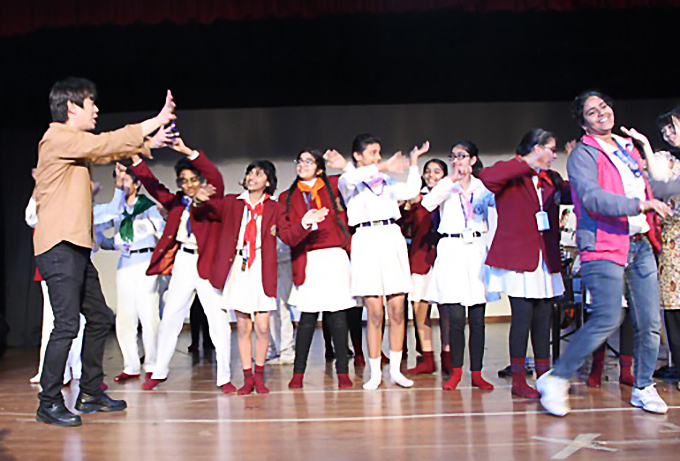 Mr. Miyazawa leading Indian students in dancing. —I watched the videos of the event. You had a very lively exchange with the audience, answering many questions. When you asked the participants what they knew about Okinawa, various answers came from them, such as Okinawa is located southwest to Japan's main islands. 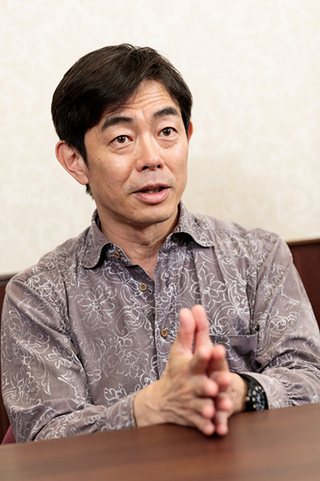 Miyazawa: They knew more about Okinawa than I had expected. I was surprised to find that they had considerable knowledge about Japan and Okinawa, and I think that's because of efforts by Ms. Morris. Even though they are learning Japanese, I don't believe many of them can visit Japan. I was delighted and moved to learn that they were studying Japanese with such enthusiasm. I thought the Japan Foundation had done a great job of making many Indian people, including children, interested in learning Japanese. The organization is working hard to make Japanese culture known to people in India. The children I met said they really liked Japan and wanted to visit the country. —What image do Indian children have of Japan? Miyazawa: Since my stay in the country was short, I can only give a guess, but my impression was that India is somewhat like a self-sufficient planet that has essentially everything it needs. It has a large area and a large population. It is blessed with rich cultural traditions. On the other hand, India boasts many cutting-edge technologies including sophisticated information technologies. So India can basically do without close global exchanges with other countries. Because this has been the situation for a long time, the arts of India are also concentrated—they aren't diluted by outside influences. IT, however, has nothing to do with traditional Indian systems. Anyone with talent can achieve international success in this area. That's why, I believe, many Indian people are interested in the "cyber city" of Tokyo. Although I said India has basically everything it needs, many Indians actually want to open the door to the outside world. That's the impression I received from young Indians. Students listening to Mr. Miyazawa's talk with great enthusiasm. —When you talked about Okinawa you started with the Battle of Okinawa during World War II, instead of things like the island's beautiful coral sea. Miyazawa:If I had started by describing Okinawa as a beautiful subtropical island with many palm trees, the participants would have listened to the rest of my talk with a preconceived image of Okinawa as a resort island. I decided to avoid this by talking about the reality of Okinawa first. —I think that is a wonderful approach. But the battle took place more than seven decades ago, long before the Indian children in the audience were born. Did you feel that your message got through to them? Miyazawa: Yes. I sang "Shima Uta," a song inspired by stories about the Battle of Okinawa. I felt they understood my message. Music has a lot of power. I think the song was more effective than words would have been at getting the message through to the children. —The children also seemed to be quite interested in the sanshin. Miyazawa: That may be because I compared the Okinawan lute with the Indian sitar. I told them, for instance, that a sanshin has fewer strings. A sitar has a large number of strings including sympathetic strings. —All children knew the sitar, even if they had never played the instrument. For Indians the sitar is probably like the koto or the samisen for Japanese. Miyazawa: Yes, probably. More and more people all over the world are now beginning to realize the great value of traditional instruments. I think that is also happening in India. —Your lecture this time was short, only 40 minutes. If you have another opportunity, what kind of message would you like to deliver then? 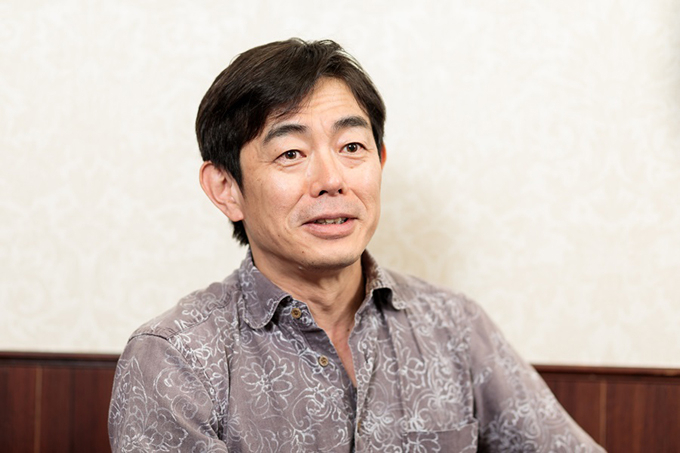 Miyazawa: There are inevitably limits to what I can do alone. I would like to take players of various instruments to India next time. I would not say dozens, but several players. It would be great if I can take performers of Eisaa. There are organizations of people who perform Eisaa, not just in Okinawa but all over the world. But I don't think a troupe of authentic Eisaa performers has ever visited India. It would be exciting to see native Okinawan Eisaa performers working with performers of traditional Indian performing arts. Okinawa also has a large number of unique folk songs and a legion of good folk song singers. My wish is to take such performers and give people in India an opportunity to experience the wonder of authentic Okinawa folk songs. Instead of veterans, I would take promising young performers who will lead the Okinawan performing arts scene in the coming years. It would be amazing to stage real Eisaa performances in India. This was the thought that was in my mind when I grudgingly came back home. I couldn't do all of this by myself this time. —In recent years you are involved in a wonderful project to collect Okinawan folk songs, produce sets of CDs of these songs and donate them to schools and libraries in Okinawa as well as associations of people from Okinawa Prefecture around the world. How did you first get interested in Okinawan music? Miyazawa: My very first encounter with Okinawan music was when I heard "Haisai Ojisan" by Okinawan rock musician Shoukichi Kina. It became a huge hit in Japan in the 1970s, several years after administration of Okinawa was returned from the U.S. to Japan. Although I was a kid, the song was a great eye-opening experience for me. What on earth is this? I thought. Some years later, many Japanese musicians such as Haruomi Hosono, whom I respected a lot, Ryuichi Sakamoto, Akiko Yano and Makoto Kubota, started approaching Okinawa through their work. Hosono, for instance, composed Roochoo Gumbo (included in his 1976 album "Bon Voyage co."), a song that mixes Okinawan music and the music of New Orleans. As I became familiar with this trend, I was quite ready to embrace Okinawan music myself. Later, around the time I made my debut as a professional musician, I asked myself whether I was happy to just keep copying the kinds of music created by British and American musicians. I asked myself whether I, as a professional musician, shouldn't be creating my own original music. Even though I was only starting out, I felt I should create something British rock bands cannot create. As I searched into myself for my cultural roots as a native of Yamanashi Prefecture, however, I found nothing that could inspire my artistic creation. Unfortunately, there aren't many powerful and tangible cultural heritages left in today's Yamanashi, partly because local warlord Takeda Shingen (1521-73) was defeated and central areas in the prefecture were burned to ashes by air raids during World War II. By stark contrast, traditional cultures have been handed down and remain alive in Okinawa, despite the fierce ground battle. That made me interested in Okinawa and I started learning about the islands. A member of my staff learned about my interest and went to Okinawa to buy many cassettes of folk songs for me. —How did your initial interest in Okinawa flourish into the song, "Shima Uta"? Miyazawa: After I listened to those cassettes of Okinawan folk songs, I was gripped by a strong desire to visit the islands that had produced the beautiful pieces of music. So I made a trip to Okinawa myself. When I actually heard sounds of sanshin played live and local folk songs sung live, I became even more enchanted by Okinawan music. At the same time, I came to know more about the Battle of Okinawa. It is hard to believe that one in every four local residents died in the war, isn't it? The total death toll, including Japanese and American soldiers as well as civilians, topped 200,000. I also learned the tragic facts about mass suicides. It's not okay to be ignorant of all these facts. I felt ashamed about my ignorance. Not only that, I got angry at myself for knowing nothing about such important things for so long. Then I wondered what I could do to deal with the feelings of shame and anger. By that time, I had released my second album as a professional musician. So I decided to compose a song. In the southern Okinawan city of Itoman, there is a facility called Okinawa Prefectural Peace Memorial Museum. Although I went to Okinawa to know more about Okinawan folk music, I couldn't help being intrigued by the many signs of its tragic past. At the museum, I was stunned to learn what had happened in Okinawa. I listened to the stories told by survivors of the Himeyuri student corps, a group of female high school students formed into a nursing unit for Japanese soldiers who fought in Okinawa. Himeyuri survivors have been telling word-of-mouth stories of the war to people who don't know, like me, out of a sense of mission and of obligation to the members who died. On the way out, I wrote in the museum's questionnaire, "I will make a song for the grannies who told me the war stories." Then, I returned to Tokyo and composed "Shima Uta." It was one of my earliest songs and not a product of serious research on Okinawan music. "Shima Uta" was the first song I learned to play on the sanshin. For a while after I composed the song, I agonized over whether I should release it. I was not sure whether a rock band from Yamato (the Japanese mainland) should perform sanshin music. Mr. Miyazawa released the first version of "Shima Uta" as an Okinawa limited-edition single to express his gratitude to Okinawa. Around that time, I met Shoukichi Kina in person. He strongly encouraged me to go ahead. He said there is a solid invisible wall between Yamatonchu (people of mainland Japan) and Uchinanchu (people of Okinawa). I will come over your side, so you come over to our side, he said. His words convinced me to release the song. I wanted to write the lyrics entirely in Okinawan dialect, but Mr. Kina advised me against it, saying since I'm not an Okinawan I had better use Okinawan language only partially. Thus I wrote the "Uchinaguchi (Okinawan language) version" of the song. As a token of my gratitude to Okinawa, which had taught me so many things, I released the version as an Okinawa limited-edition single with a note saying it was produced under the supervision of Shoukichi Kina. The song evoked a massive response, but I kept it an Okinawa limited edition because I composed the song for Okinawa. I then made the standard Japanse-language version of the song and released it as a single. That is the version that came to be known widely. The "flower of deigo" (tiger's claw, Erythrina variegata) mentioned in the song is designated as the official flower of Okinawa Prefecture. Deigo is native to India. So the plant was first brought to Okinawa by someone. That is one little known link between Okinawa and India. I hope such links will develop into more active exchanges. The cultural ties between India and Okinawa have yet to flourish fully. Mr. Miyazawa (center) and participants posing for a photo after the event. While living in Tokyo, Mr. Miyazawa spares no effort to contribute to Okinawa through various activities. He regularly visits Okinawa, teaches music at Okinawa Prefectural University of Arts, collects local folk songs, and organizes folk song concerts. After he learned that the huge popularity of "Shima Uta" has increased demand for ebony (called Kuruchi in Okinawa), a material for sanshin, so sharply that Okinawa had to start importing it, Miyazawa launched a "Kuruchi No Mori 100-year Project,"an effort to plant and grow ebony trees in Okinawa. Miyazawa is clearly the best suited for the role of goodwill ambassador to introduce Okinawan culture to India. "The war is not really over, so stories about the war should continue to be told," Mr. Miyazawa said. "All of my activities are based on this sense of mission. 'Shima Uta' is a song to pray for peace. Permanent peace. I hope that someday it will no longer be necessary to sing such a song." Born in Kofu, Yamanashi Prefecture, in 1966, Kazufumi Miyazawa made his professional music debut in 1989 as the vocalist of rock band The Boom. Drawing on his outstanding spirit of inquiry and forceful energy, Miyazawa has traveled around the world in search of sources of powerful music and released many albums. "Shima Uta," his signature song, became a big hit not just in Japan but also in Argentina (in 2001), and continues to gain international popularity.